By Anjaly Jolly, School of Legal Studies, CUSAT. 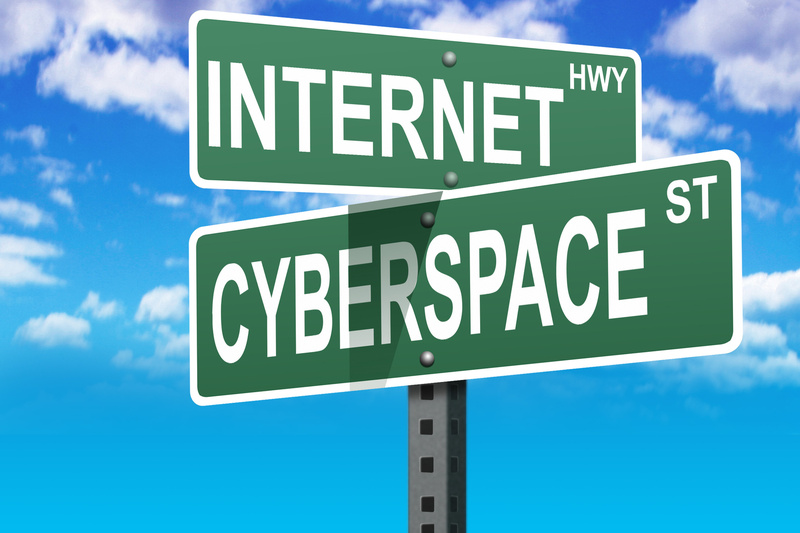 Cyberspace can be defined as the global network of interdependent information technology infrastructures, telecommunications and computer processing systems in which online communication takes place. The concept, being a metaphysical approach , has its presence even in the smallest burst of events extending upto artificial intelligence with the intercession of an internet service provider. Thus legally, Cyberspace is a domain characterized by the use of electronics and the electromagnetic spectrum to store, modify, and exchange data via networked systems and associated corporeal infrastructures. In effect, cyberspace can be defined as the interconnection of human beings through computers and telecommunication, without regard to physical geography. Cyberspace is hence “the speculative environment in which communication over computer networks occurs.” The term derived from the ancient greek word cybernetics ,was first used in science fiction and cinema in the 1980s, was adopted by computer professionals and became a household term in the 1990s. During this period, the uses of the internet, networking, and digital communication were all growing dramatically and the term “cyberspace” was able to represent the many new ideas and phenomena that were emerging. With the advent of technology and the progress thereof, cyberspace has gained significant momentum. Jurisdiction matters relating to cyber world appears to be a conflicting jurisprudence in cyberspace. The legal definition of the term jurisdiction corresponds to the authority to decide upon matters by making decisions and judgments. Generally, jurisdiction can be classified as the power to prescribe, authority to adjudicate and the clout to enforce (The power of a sovereign to effect implementation of its laws). The jurisdiction to prescribe relates to the right of a state to make its law applicable to the activities, relations, the status of persons, or the interests of persons in things. Cyberspace, being a borderless world, refuses to pact to the geopolitical limitations the admiration that private international law has always accorded to them and on which it is based. The dilemma of jurisdiction crop up as it is only in the real world that there subsist mechanisms to bestow rights, immunities, privileges, etc. with no corresponding equivalent in the cyber world. In other words, rights are rights only vis-a-vis the real world. On account of the disparity in the normative standards of conduct among the different political units in the real world, the issue of jurisdiction becomes particularly pertinent, for what may be legal in one legal system may be prohibited by another, and the same may be circumstantially justiﬁable in yet another. But in the real sense, the difference between legality and illegality is not maintained in the cyber world, independent of the real world. When the real world players become cyber actors and perform acts not considering the legal frameworks, the following question frequently arises: whether each cyber actor is justiﬁed in acting pursuant to the philosophy of ‘‘legality’’ as established in his own legal system alone, whether based on nationality or domicile or mere territorial presence, and thereby imposing them on the whole world? A related and more difficult question is one of choosing a judicial forum and seeking remedies particularly where an act committed in cyberspace by a person, subject to the sovereignty of one state, amounts to the violation of a right guaranteed by another. Another significant question, with regards to jurisdiction is the forum for adjudicating the issue and for seeking remedies particularly when an act committed in cyberspace by a person, subject to the sovereignty of one state, amounts to the violation of a right guaranteed by another. Keeping in view, the principles of private International law and international comity, each state must accord to the doctrine of sovereignty and must not interfere with the aspects by which the supremacy is manifested by others. Jurisdiction principles, both personal and prescriptive, were originally derived from an assumption about the absoluteness of boundaries and sovereign power within them and were grounded in political practicality. Cyberspace specifically disregards the general correspondence, existing in the real world, between physical borders and ‘‘law space’’—based on considerations of power, effects, legitimacy and notice. The law, in the ‘‘non-virtual world’’, works essentially on a two-way premise that a certain set of legal rules is applicable to only one set of persons, who are present within the limits of the sovereign prescribing such rules, and to none other; and that a certain set of persons are required to comply with only one set of standards, and with none other. It is this observation, which having been mutually recognised and accepted by most sovereigns gives the requisite strength and legitimacy to each sovereign to enforce its legal rules within its territory. taking information out of cyberspace. Thus legally, in cyberspace, there are two distinct actors: the uploader and the downloader. Under this theory, the uploader and the downloader act like spies in the classic information drop — the uploader inputs information into a site in cyberspace, and the downloader accesses it at a later time. Neither need be aware of the other’s identity. Unlike the classic information dive, however, there need not be any specific intent to communicate at all. Some areas of the internet are accessed by thousands of people from all over the world, while others fade away as down trodden paving stones on the seemingly infinite paths of cyberspace. In both civil and criminal law, most actions engaged by uploaders and downloaders present no jurisdictional difficulties. A state can forbid, on its own territory, the uploading and downloading of material it considers harmful to its interests. A state can therefore forbid anyone from uploading a gambling site from its territory, and can forbid anyone within its territory from downloading, i.e. interacting with a gambling site in cyberspace. This theory can be very well demonstrated with the aid of two US cases. Namely the Schooner Exchange and the Cutting edge case. In the former, it was held that a French war vessel was not subject to American law, although it was in an American port. Similarly, a webpage would be attributed the nationality of its creator, and thus not be subject to the law of wherever it happened to be downloaded. The Cutting Case provides an illustration as to how an uploader should be viewed in a foreign jurisdiction that is offended by material uploaded into cyberspace. Mr. Cutting published an article in Texas which offended a Mexican citizen. When Mr. Cutting visited Mexico he was imprisoned on criminal libel charges. The United States Secretary of State instructed the U.S. ambassador in Mexico to inform the Mexican government that, “[T]he judicial tribunals of Mexico were not competent under the rules of international law to try a citizen of the United States for an offence committed and consummated in his own country, merely because the person offended happened to be a Mexican.” Thus, the general rule is that where uploading certain material is a crime, it is an offence “committed and consummated” in the state where the uploader is located. In case of foreign defendants, the US Supreme Court exercises its jurisdiction by considering the out of state doctrine. According to the decision in Hess v. Pawloski, there are two requirements subject to which a court can exercise personal jurisdiction over an out-of-state defendant. The first one being the statutory authority granting the court jurisdiction over the defendant and the second one being the fulfilment of due process clause of the Constitution. Mere physical presence in a state is always a basis for personal jurisdiction. The exercise of jurisdiction is permitted over people and property within the territorial borders. In such a case, physical presence in a forum state is a basis for personal jurisdiction, even when an out-of-state individual enters the forum state for a brief time.Physical attendance in the forum state satisﬁes the requirement of constitutional due process. Every state possesses exclusive jurisdiction within its territory. No state can exercise jurisdiction over persons without its territory. The minimum contacts theory was sketched in International Shoe v. Washington. The court ruled that a non resident may be sued if the party has certain minimum contacts with the state such that maintenance of the suit doesnot affect traditional concepts of ensuring substantial justice. The defendants contact with the state must be establish to invoke the jurisdiction. General jurisdiction is permitted over an out of state defendant for non-forum related activities when the defendant has engaged in systematic and continuous activities in the forum state. Specific jurisdiction may be invoked under the test of International Shoe case and such jurisdiction may be established if a defendant has such minimum contacts with the state that it would comply with due process rights to require the defendant to find a lawsuit in the forum state. In order to further safeguard the rights of out of state defendants, a further caveat was added to the ‘‘quality and nature of minimum contacts test’’. This was that the defendant’s contact with the forum state should be foreseeable, i.e. a court would not have jurisdiction unless it could be revealed that the defendant had ‘‘purposefully availed’’ himself of the privilege of conducting business in the forum. This ‘‘critical’’ test of ‘‘foreseeability’’ is not the mere likelihood that a produce will ﬁnd its way into the forum state, but required a reasonable anticipation of being hauled into court there. The principle applied by the US courts in determining the jurisdiction of the forum in matters relating to insurance can be summed up as ‘the likelihood that personal jurisdiction can be constitutionally exercised is directly proportionate to the nature and quality of commercial activity that an entity conducts over the Internet.” This has been decided by the US Supreme Court in Zippo Manufacturing Co v Zippo Dot Com, Inc 952 F. Supp.1119 by considering the ratio of International Shoe case. The English law recognises the rule of territoriality as the principle of adjudicative jurisdiction. The law recognises personal jurisdiction when the defendant is present within England and the writ is served upon him and when he is served at the discretion of the court or he submits to the jurisdiction of the court. The case law to the point is Deverall v. Grant Advertising Inc. In the international phase, systematic and continuous contact may be required and hence websites by itself may not subject a party to global jurisdiction. However, tortious acts using the internet directed towards in the forum acts using the internet directed towards in the forum state may be subject to its jurisdiction. Firstly, where the defendant actively does business over the internet directed at the forum state, the same can exercise jurisdiction over the defendant. Secondly, where the website provides a lower level of interactivity by permitting the defendant to transmit information with customers over the Internet, the court must assess the level of interactivity and the commercial nature of the website to determine if sufficient contacts exist to warrant the exercise of jurisdiction. In a German case, the court found that it could exercise jurisdiction over a defendant based in Kansas City based on the fact that the website operated at the defendant’s domain name was accessible at the plaintiff’s location in Germany. The Convention on Cyber crime was opened at Budapest on November 2001. The same marked as the first ever treaty on criminal offences committed against or with the help of computer networks including internet. The Convention aims at pursuing a common criminal policy aimed at protection of society against cyber crime by adopting appropriate legislation and fostering international co-operation. The Convention on cyber crime regards cyber crimes as extraditable offences. By virtue of Article 24 , the offence is extraditable if punishable under the laws in both contracting parties by imprisonment for more than 1 year or by a more severe penalty. Cyberspace, being a borderless frame work raises legal questions that are required to be dealt with internationally. For instance, an act or any network may be illegal in India, but legal in US. They can be viewed in India by anyone and this amount to an offence under the IT Act 2000 but not under the US legislation. Dow Jones & Co., the publisher of Wall Street Journal was sued in Victoria, Australia by Joseph Gutnick, for publishing an online Article named ‘Unholy Gains’ on servers maintained at New Jersey , US. The court held that as the materials complained of was made comprehensible when downloaded in Victoria , the courts in Victoria had jurisdiction. The suit was filed against two newspapers making defamatory comments on a prison warden in Virginia. The jurisdiction of the court was objected. The District court accepted the jurisdiction but the same was reversed by the US Court 4th Circuit. The appellate court ruled that the newspapers did not target their websites nor had they published the same for the Virginia audience, so merely because any one could download the articles from the website did not bestow jurisdiction to the Virginia court. Yahoo, the Internet Service Provider, displayed Nazi materials and provides auction of Nazi insignia. The French Law considered it as illegal , but a French user could see Nazi material and also purchase Nazi insignia from Yahoo site. A suit for injunction filed against Yahoo was allowed. Yahoo simultaneously filed a suit in the US court to declare the French order unenforceable as it violated the first amendment to the US Constitution. The district Court ruled that the Constitution protects free speech and trumped the French court requiring Yahoo to remove Nazi material from the website. In Ramanatha Chettaiar v. Soam Suntharam Chettiar, the court held that India follows the well established principle of private International law that the law of the forum in which the legal proceedings are instituted governs all matters of procedure. In BulBul Roy Mishra v. City Public Prosecutor, the court held that the approach adopted is similar to the minimum contacts approach of the United States couled with the compliance of the proximity test of the Code. In case there are more than one courts having jurisdiction over a subject matter, an agreement between the parties to confer jurisdiction only on one of the courts to the exclusion of others is valid. The case law to the point is Hakkam Singh v. Gammon India Ltd AIR 1971 SC 740. This party autonomy however does not extend to confer jurisdiction upon a forum which inherently lacks the same. In case of jurisdiction in cyberspace, the principle followed in India is where the contract contains a choice of court clause, the Indian courts do give due consideration to the clause. On the other hand, if the same is not provided in the agreement, the Indian Courts would apply the test contained in sec.20 of the Civil Procedure Code. To determine whether the cause of action arose in the local limits of a court, the court generally evaluates the conclusion of the contract. However, this principle has much less relevance with regards to e-contracts. There exist an opaque confusion between the rules governing completion of communication, acceptance and revocation. India has entered into multi lateral treaties with nearly 20 countries to attain legal compatibility while dealing with cyber matters. However by virtue of sec.188 Cr.P.C. previous permission of the Central Government has to be obtained to deal with offences committed outside India. According to sec.75 of the IT Act, the Act applies also to any offence or contravention committed outside India by any person irrespective of his nationality if the act or conduct constituting the offence or contravention involves a computer, computer system or computer network located in India. jurisdiction issues in Cyberspace has much relevance with regards to Copyright matters and defamation(libel) suits. Besides giving undue weightage to the minimum contact theory, it would be better if the courts could analyse the facts to ascertain the actual proximate cause. For this purpose, judicial mind has to be applied for determining the actual cause. This approach would ensure that the state imparts justice in each individual case in accordance with the Constitutional mandates. The ultimate effect of the action should be considered as the basis of jurisdiction. However, in cases pertaining to social welfare including consumer matters, a much liberal approach has to be adopted. The courts while dealing with Cyber cases has to ensure that the principles of natural justice are properly met. Cyberspace is an amorphous space that operates logically covering different spheres of law including Intellectual property rights infringement issues. The confusion as to jurisdiction of the forum in the matters relating to this borderless world forms a vital aspect in Cyber Jurisprudence. Yet, cyberspace plays a vital role in the day to day affairs of a human being in this modern millennium.